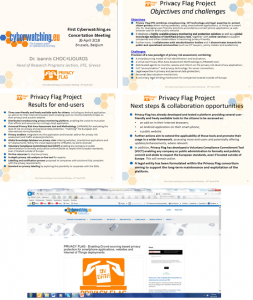 The Privacy Flag project has also submitted material that has been presented to the First Cyberwatching.eu Concertation Meeting, held in Brussels, Belgium, on April 26, 2018. The objective of this first Cyberwatching.eu concertation meeting has been to take stock of the current R&I landscape and to identify common themes and challenges for clustering activities. With a strong EC presence, this is a key event to ensure all the projects of the catalogue get noticed. There will be opportunities for all projects to have their say through interactive discussions, break-out sessions, position papers and presentation opportunities. Privacy Flag has submitted material that has been included in the core information of the event.